Ionidea Enterprise Solutions Career Jobs Opening 2018-2019 Data Entry Operators Job Posts Download Application at www.ionidea.com. 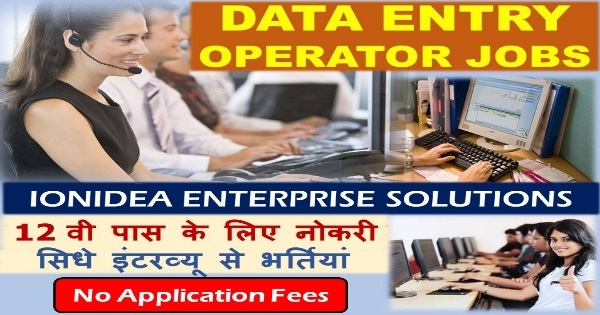 Ionidea Enterprise Solutions Career Job has Recently Announced 2018 regarding Data Entry Operators & Various Job Openings Interested and Eligible Candidates can Download Application Through Official website. Ionidea Enterprise Solutions Career Walk-in Drive Freshers|| Any Graduate @ Bangalore - Apply Now. Salary: Rs: 2,00,000 - 2,25,000 P.A. Net Speed 40 WPM and Accuracy of 90% and above - Mandatory. Must have knowledge on Microsoft tools (Excel, word, Internet Browsing) - Mandatory. Bangalore-66, Landmark- Near KTPO Bus Stop."